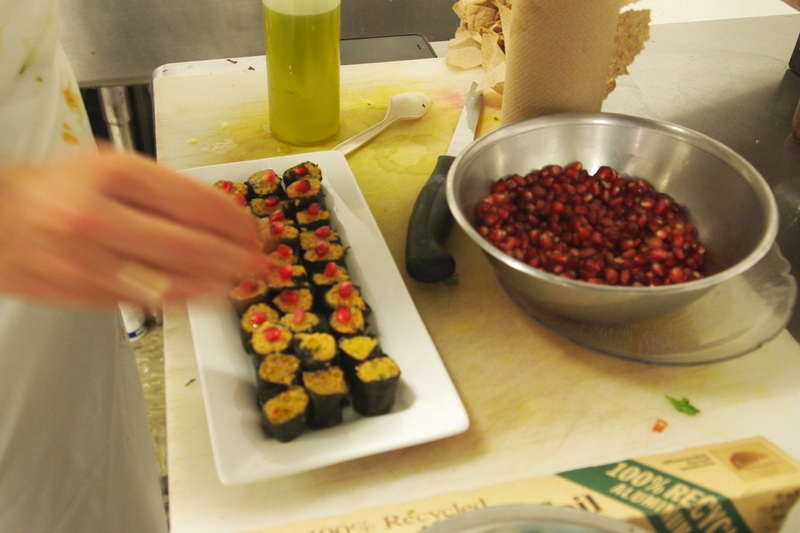 I cooked my first pop-up dinner in Seattle at Caffe Torino last night. It was an enchanting experience. 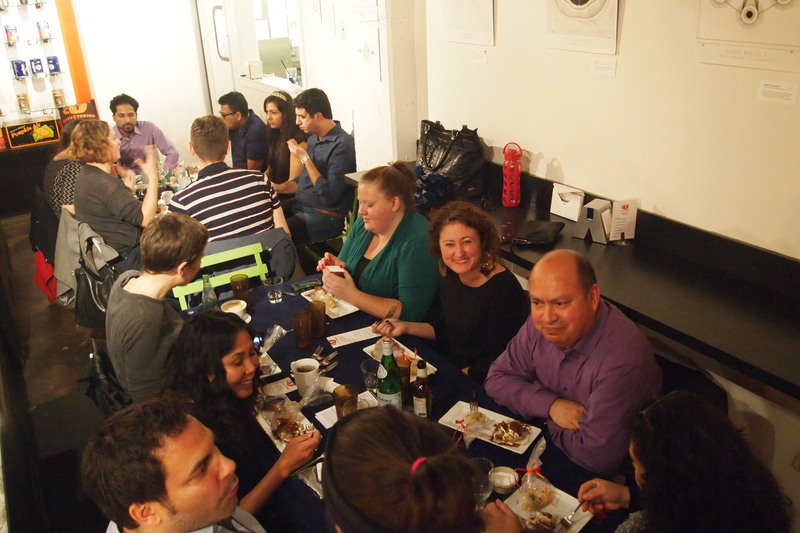 Even if it is taxing in the body- making and sharing food is exhilarating. The dinner was for 35 people. 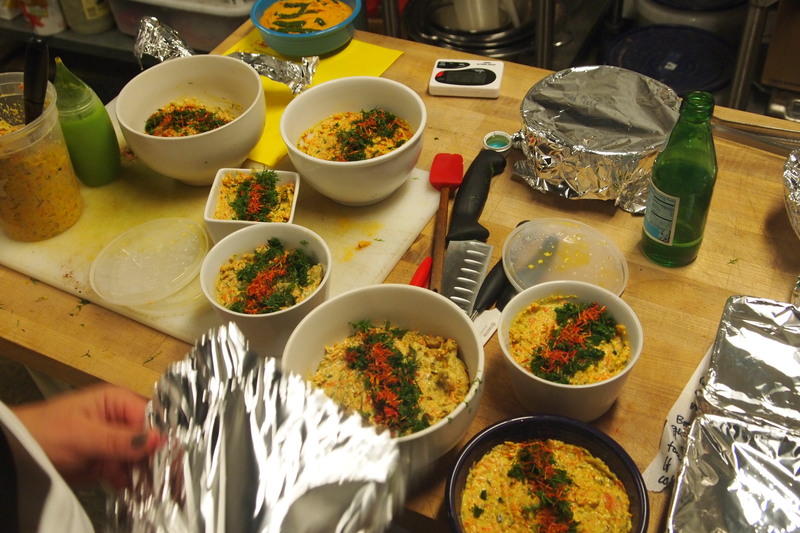 My friend Ruchika was my sous-chef and helped me throughout the process. The photos are taken by my husband Matt. He has also helped before, during and after. 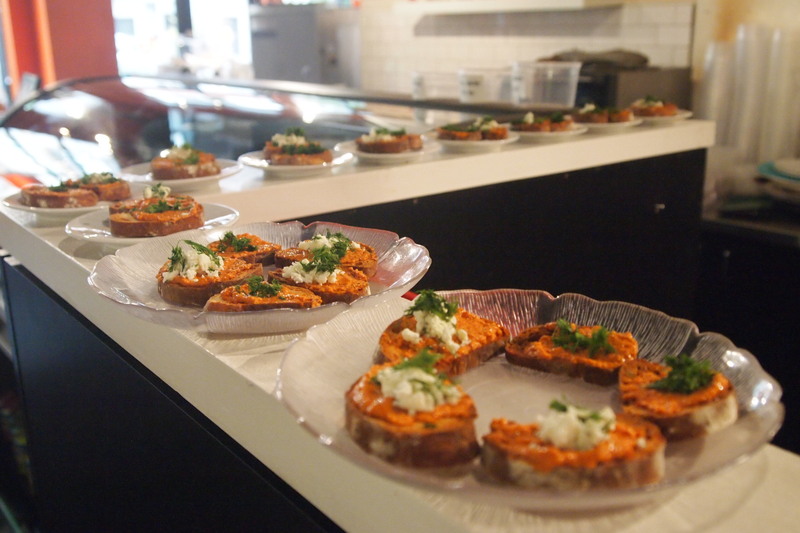 We started the evening with a simple amuse bouche: Muhammara covered crostinis topped with feta and chives. Inspiration for this recipe comes from Ece Aksoy – Istanbul/Turkey – a lifelong friend and the owner of my favorite restaurant. She does this shape with just a bulgur filling. 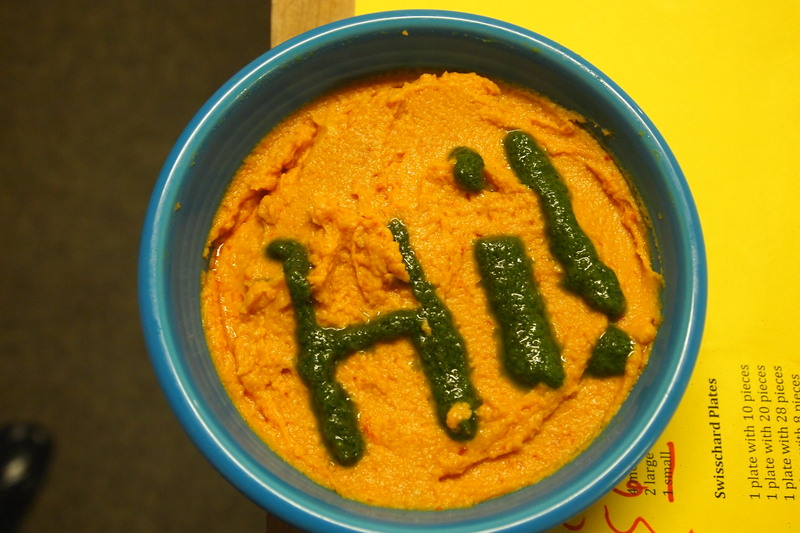 I wrote on top of each sundried hummus a fun message – just saying hello via basil oil! Green and orange veggies (carrot and zucchini) gets a green and orange topping (haspir and dill). Next up was main course which was succulent lamb/veal meatballs, tomatoes filled with shepherd’s salad that had a pomegranate balsamic vinaigrette and rice topped with sautéed barberries. 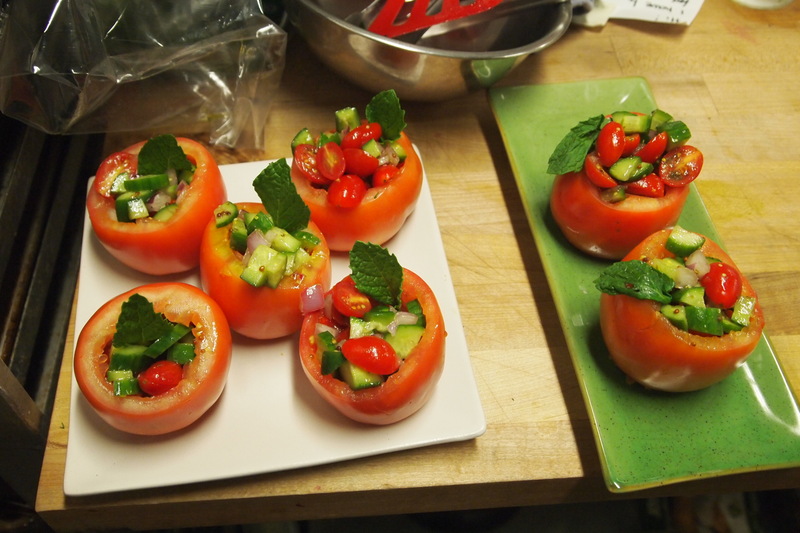 The idea of filling the tomatoes with salad came from my mother! 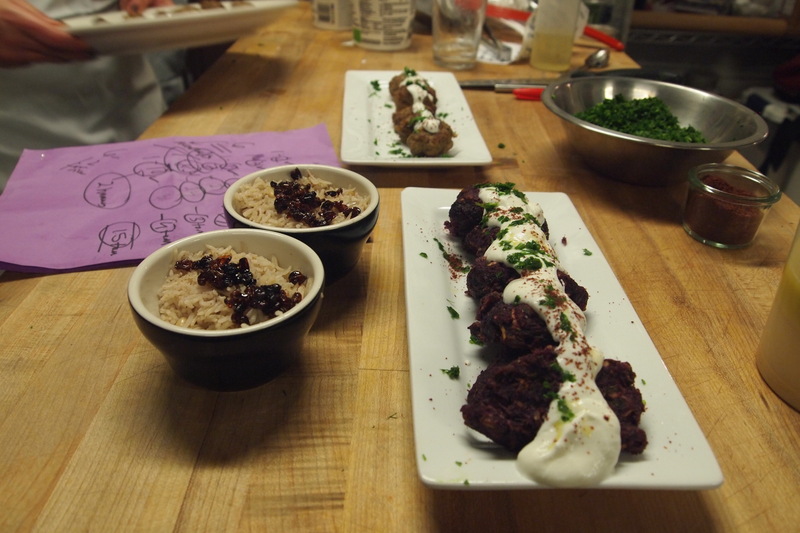 The meatballs are topped with sumac spice and are brushed with tahini as they are baked. Barberries are an Iranian delicacy. 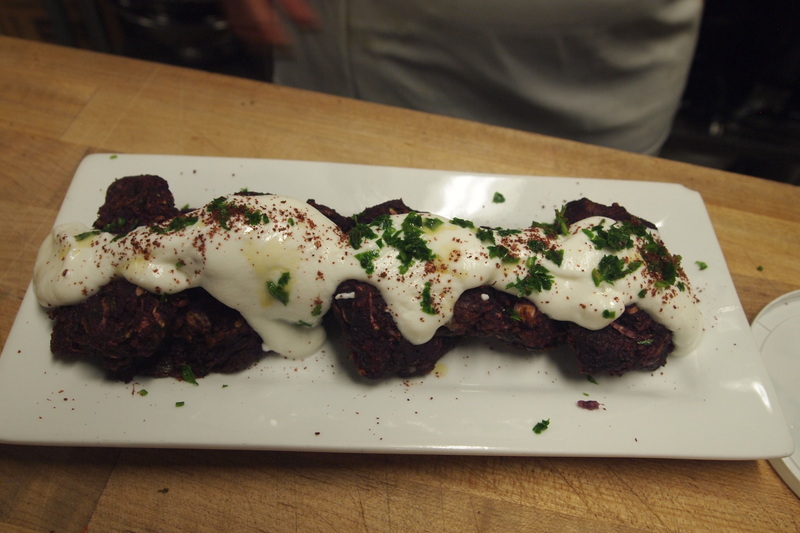 I also made a vegetarian option – as tasty as the meatballs of purple sweet potatoes, zucchini infused with a combination of spices like allspice, cinnamon, antep pepper and cumin. It also looked exactly like the main dish (hence the purple)! The final course was desert. 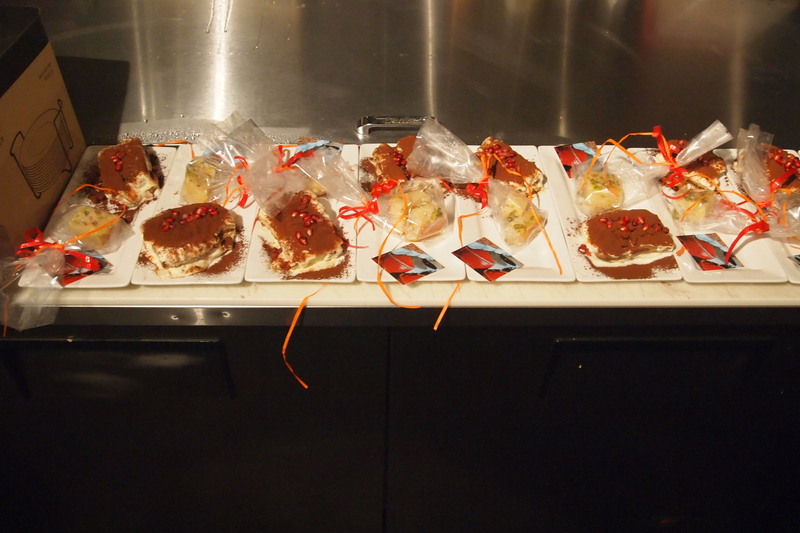 In the bags are the desert home-made by me – which are revanis (semolina cake topped with syrup) . The tiramisu is the owner of Caffe Torino’s mother’s recipe. We infused tiramisu with some mastic flavoring and topped with some cocoa and pomegranates. The card is my business card featuring photos of spices from Antep/Turkey. The participants were happy and full! We were tired, not hungry but also very happy! A big table was filled with friends from Seattle.